Now, the greatest discoveries you make when you are actually not looking for them right? At least for me thats the case. Sometimes I simply wander around without any expectations and then suddenly a discovery strucks me and I will feel like: “WTF!? 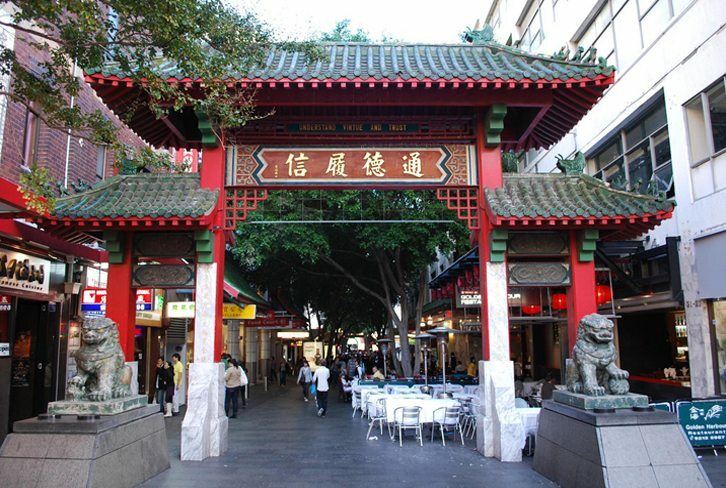 How lucky am I please?” And this happened to me in Sydney`s Chinatown with Topotea. One day in the not so distant past I was walking around in Chinatown. I love this part of Sydney because it somehow actually invites me to make new discoveries. There are just so many foreign things I have not seen or heard of before. Chinese bakery stuff, Chinese 1-dollar shops, Chinese groceries and just so many Chinese eateries. Each time you go there you are bound to make new experiences and see something you have not seen before. Topotea Tea Shop in Sydney`s Chinatown. Sooner or later I stumbled into this shopping center, it was the Sussex St shopping centre right at Haymarket. Probably I was just looking to be fed and went up to the Food Court to get me some cheap GOOD food from one of those many different stalls. But my original intention of getting something to eat was soon replaced by uprising curiosity about this shop I just came across. At the very depth of the shopping centre, in the lower grounds, there was a tea shop very well hidden. I approach new things often in a more of a careful way and checked that place out from the distance and tried to peak inside a little. It was definitely more of a typical Chinese place and quite different to a Western influenced tea shop. Right at the entrance there was a little table with some people having tea. It was a beautifully decorated table, with a proper tea tray on top of it, several tea pots loaded with freshly made tea and many little tea accessories like tea pets and incense. The owner was sitting at the table and seemed rather busy talking mandarin to his guests, so I sneaked by the table and entered the actual tea shop. Besides it obviously being a tea shop it almost rather looked like an Asian furniture shop. There were tables and cupboards with decorations on top of it. On these pieces of furniture there were also many little tea pots, tea cups and many little unidentifiable things. This was the thing that irritated me the most and just made it not look like your average, lets say T2, tea shop. The „Welcome“ Tea table at the entrance of Topotea. All of the things I observed in the shop appeared to be of very high quality and I especially noticed this when I was taking a closer look at the impressive Yixing tea pot collection at the back of the room. They were beautiful to look at and a further check on the prices on the pots revealed that they not only looked expensive, but actually are sold for uncommon high prices, which you would usually not expect from your average Chinese shop. This retailer here obviously focuses on quality – “very interesting”, I thought, “very different”. On my first visit I did not have the chance to really get in touch with the owner and it also took me a while before I would return to this special place. But it was always in the back of my head, that one day I want to return to Topotea and really get to know the owner and the philosophy of the place. And then last week I finally made my plans become reality and returned to the place. I had a great tea session with the owner Shane and we were having tea just at that place where I saw him living it up tea-wise with his Chinese guests last time. That day I returned it was fortunately rather quiet, so we had lots of time to talk. I found out that its a very new business of his. He opened the doors to the shop just about a year ago and is busy building up his circle of regular and returning customers. I was reassured by him that his shop concept is built on quality. The tea wares, the teas and the tea furniture are all of a quality that would also range in China in the more high priced segment. 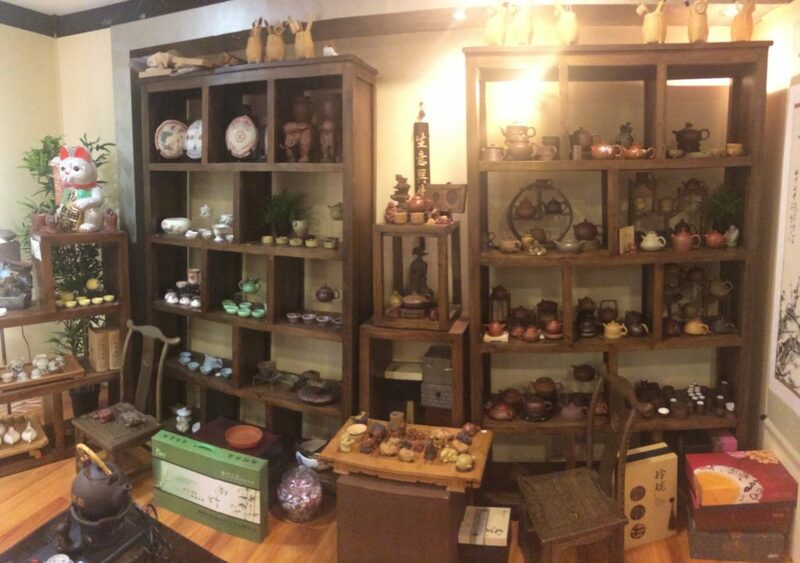 Backrow with Yixing tea pots and more at Topotea. The knowledge Shane had about tea was vast and and I could not stop listening. 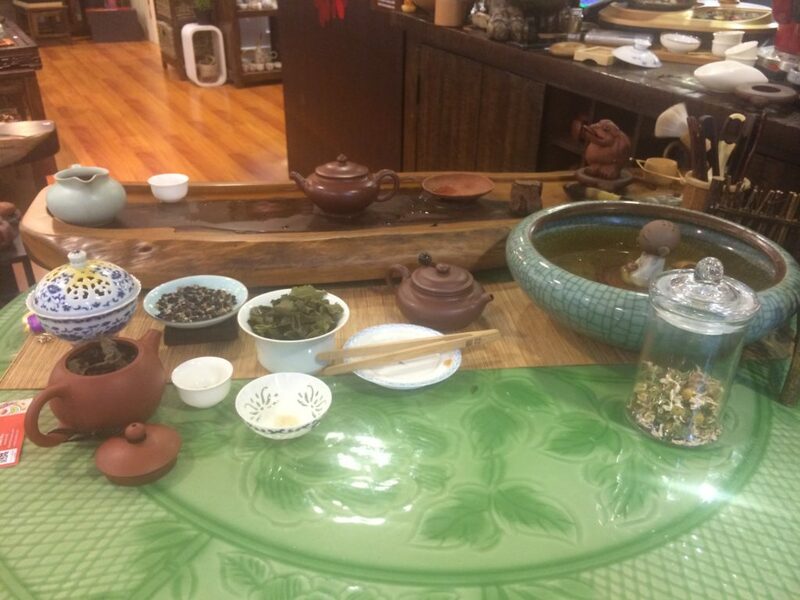 He comes from Fujian province and therefore it was of no surprise that his tea shop’s focus lies in Ti Kuan Yin tea, which is a typical Fujian kind of tea. It was also the tea then we first tried and really got to “dissecting” – we had minimum 5 plus infusions. Compared to other Ti Kuan Yins I had before, I was surprised by the rather green and floral aspects of it. It was more the caliber of a young, fresh tea, than those more mature, dark, full-bodied Ti Kuan Yins I had before. It was definitely a tea you will have to pay some close attention to in order to really discover its beauty, it had a very subtle taste. But not just by the flavor you could tell the quality, when you took a closer look at the leaves you could see, that they were picked and processed with care. But even though I very much enjoyed that Ti Kuan Yin, the tea that really made an impression on me was the one we tried after that. Shane’s introduction to it, which said that this will be “his hometown tea”, a tea the locals drink, made me become extra excited. The color of the tea was rather dark this time and both the flavour and the smell were very fruity. I have not had anything like that before. It was an Oolong, too, made in the “traditional way” Shane told me and the very specific characteristic of it was that the tea plants on the plantation are lined up next to Orchard flowers. Insects like Butterflies visit both plants and do their part of combining both plant flavors with each other. Therefore the tea plant has naturally gained some of this Orchard flavor – fascinating, isnt it? Consequently I had no choice but to get me some of this tea and experience it more in depth at home. Its definitely one of those teas that you regard as being something very special. Shane further told me that he offers tea sessions for $15 a person. Back in the shop there are, a little hidden, a couple of wooden tables. They invite you to rest, relax and drink tea – its wonderfully quiet and private back there. In one of such tea sessions you can decide if you want to prepare tea by yourself or leave it to “the master”. You can choose from the whole range of tea Topotea has to offer and you will get the chance to try those teas and enjoy them in peace and at slow pace – right in the shop. You can bring up to 6 people with you and basically stay as long as you wish. I already attended one of his tea sessions and it creates the perfect atmosphere to just meet with a friend and talk, while trying all different kinds of tea. And when you are really lucky, then on the day of your visit Shane will have some spare time for you and you will have the chance to listen to one of his many fascinating tea stories. Hey, this place looks INTERESTING! looks like i could easily spend hours there inspecting the antiques. Sorry, i saw your messege too late about the catchup. Bei The Silence in Tea steht die Liebe zum Tee im Mittelpunkt. The Silence in Tea bietet regelmäßig stattfindende Tee-Veranstaltungen wie Seminare, Zeremonien und Meditationen im Großraum Berlin an. Auch für Teamevents und individuelles Catering auf größeren Veranstaltungen kann The Silence in Tea gebucht werden. Schreib dafür einfach eine Email oder rufe direkt an für ein individuelles Angebot.